Films about musicians—real or fictional—often struggle to bring interest to the processes of creation. From the bombast of Walk the Line and Ray to the relatively low-key Control or Inside Llewyn Davis, musical biopics seem to privilege sweeping tales of broken homes and families; of adversity and destitution. Most handily glaze over the question of how their subjects ever became so great at performing, and instead stage simple human drama—often to a gruesome degree—behind which the music provides little but a moral backbone. Outside of the occasional shot of our protagonist hunched over a notebook, in most films performance comes easy, and only serves to justifiably deify its creator. Behind every tale of drug-fuelled excess and abuse, there lies a soundtrack that stands testament to some sense of worth, often using the capitalist metrics of sales figures and success to justify our hero’s misgivings. In these films, musicians are born talented, and they create or perform music as a cathartic release; as little but a response to the drama that surrounds them. Whiplash, released at the tail-end of last year, is significant within this genre because it chooses to focus directly on the difficulties of creation, relegating the specifics of its human drama to little more than flavouring. Here, music isn’t some heroic or tragic escape from drama; music is the drama. Following a single student’s quest for greatness as a jazz drummer, Whiplash stages itself around the abusive relationship between a student and his instructor. There’s little in the way of exposition: the story begins in media res with our protagonist, Andrew Neyman, already well-versed in performance and theory, and proceeds to hone in on his emotional journey towards perfection, predominantly from behind the kit. Neyman’s ambition is the film’s sole narrative force, as he tries to live up to the standard of jazz greats like Buddy Rich and excel within one of the world’s top music schools. Bearing an exaggerated relevance to real-life schools like New York’s Juilliard, Neyman’s experience under the thumb of his instructor approaches the issue of ambition head-on. The vast majority of the film’s runtime is divided between a number of extended practice sessions in which the call to do better grows increasingly agitated, culminating in a make-or-break performance in Carnegie Hall. Whiplash is a fitting title. By focusing on the high-pressure atmosphere of the practice room, the film rubber-bands between the pangs of failure and the highs of success with an alarming frequency. The instructor, hinging his method on the (apparently misremembered) story of Jo Jones throwing a cymbal at Charlie Parker’s head for missing a beat, favours the stick over the carrot, ensuring that Neyman’s every success is met with increasingly higher expectations, giving the film a cyclical, almost trance-like impression, and one that stages ambition as a drug just as troubling to the human condition as any of the substances in an Irvine Welsh adaptation. Like many films of its kind, the central conflict is established on a number of broad strokes: for example, the belief that greatness is only achievable through excessive sacrifice, or that jazz, tending to an old-school interpretation of the form, is a staunchly technical pursuit. Yet whereas similar films may fall on these strokes, Whiplash contextualises them through the eyes of its central character, refusing to outright endorse them. These opinions are acknowledged for their faults: an early dinner scene with Neyman’s family, in particular, seems to hold the crux of the film’s ponderings: when presented with the question of a stable job, or local acclaim, he instead chooses to double down on his self-destructive quest to be the best, to the dismay of all around him. Although we continue to follow Neyman, the film sides with neither him nor his family, remaining so honed on the alternating sacrifices and pleasures of his charge that the viewer is left to decide themselves whether Neyman’s story should be seen as heroic or tragic (and, for that matter, whether or not greatness really is an academic pursuit). Exchanges between Neyman and his teacher—the abrasive, yet brilliant Terrence Fletcher—are particularly notable for the ways in which they cleverly delineate the intertwined ideas of ambition and sacrifice. Fletcher, in particular, sparks with great, terse, dialogue, and rarely outstays his welcome, a comment that can be passed onto the film as a whole. Whiplash is, at heart, a spectacular document of human drive and ambition, made great by its concise telling. It’s handy that Whiplash’s performances are, as has been echoed before, great: the physicality of the performances, in particular, pays off to ensure that the drumming always remains believable and impressive, both of which are key to the viewer’s investment in a film that, lest we forget, spends most of its time focused on a drum-kit. 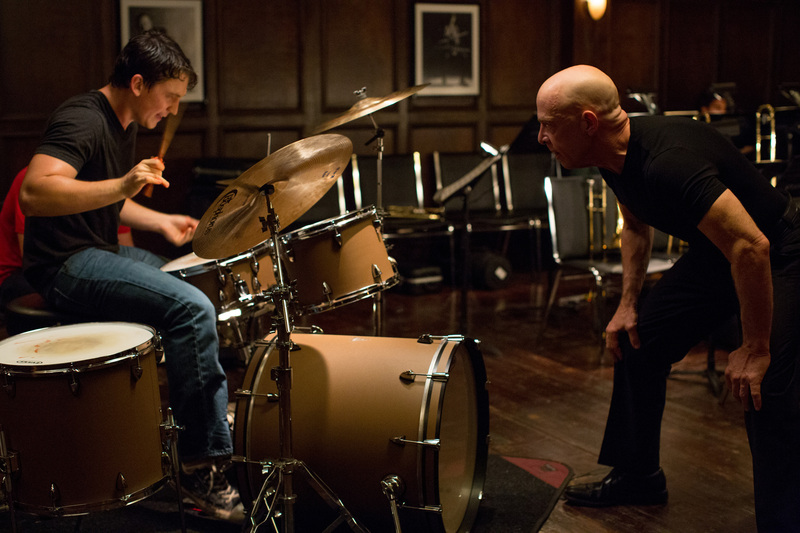 This level of physicality also ensures that Whiplash avoids one of the biggest pitfalls of most musical biopics: by focusing on the idea of ‘technique’ it guarantees that Neyman isn’t portrayed as a musical prodigy (as is so often the case, troubled only by his inability to sell records), but rather by the fact that he just might not be good enough. The tension between ideas of greatness and popularity, and success and acclaim, underpin the film’s main ethical concern: is ‘greatness’ worth the pursuit? For any rags-to-riches posturing, there’s a bittersweet element to Neyman’s every success: one that has rightly been interpreted as a flirtation with ideas of masochism. The balance between pleasure and pain seems to be drawn in smiles and blood, and the film often lingers on the latter, ensuring that as much as it glorifies the perfect technique of great jazz musicians, it also portrays the tragedy of their sacrifices. The acknowledgement that many great musicians die young is a point of focus, and our protagonist’s aspiration to the same fate is the film’s harshest critique of its subject, ensuring that it doesn’t merely remain wrapped up in idolatry and hagiography, but speaks to a humanity beyond the music: and its necessity in the first place. As a whole, Whiplash is a stunning exploration of a single idea, undone only slightly by a single set-piece in the film’s second act, one that—although arguably functional as a visual metaphor—is perhaps too explosive and shock-oriented for a film which has otherwise restrained itself to little but the power of the music itself. Similarly, JK Simmons’ character, the instructor, is problematic in that the film appears to buy into his personality cult, granting him the vast majority of the film’s comedic relief; a focus made uneasy as the grimier side of his history is unveiled. It’s easy to get the feeling that the film is skewed towards his perspective for the sake of telling a more accessible, self-contained story, and it both helps and hinders: giving the film a tighter arc, but dampening its thematic focus. The film’s closing shots may demonstrate an unwelcome Hollywood sentimentality for some. These are minor niggles, however, for what is perhaps the best musical biopic to come out in a long while. By refusing to deify its music and performers, it handily avoids genre tropes, and does so with enough directorial restraint that it rarely overindulges in its central questions. Intense, eye-opening, and perfectly paced, it’s fitting that Whiplash might actually be one of the greats itself. I just hope the bare minimum of blood was spilled getting there. This entry was posted in Films and tagged Jazz, JK Simmons, Miles Teller, Music, Whiplash. Bookmark the permalink.